Perfect for working in a bucket and comfortable from day one, these boots are waterproof to keep your feet dry and feature an EVA shock absorbing midsole with gel cushion foot bed. These boots are all about working all day. The patented U-TURN® Entry Systems makes for easy on and off and the square toe adds room to the toe box. Composite safety toe is ASTM F2413-11 M/I/75 C/75 EH rated. Color: Burin Brown leather foot and coffee leather upper. 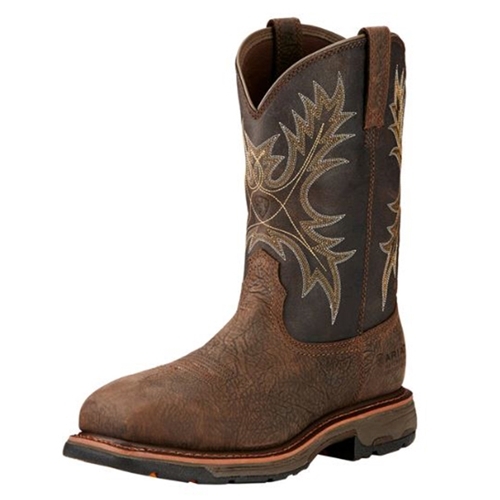 Ariat Workhog® Square Toe H2O Pull On Boot has a rating of 4.8 star based on 6 reviews.